Synopsis: Every year, Blue Sargent stands next to her clairvoyant mother as the soon-to-be dead walk past. Blue never sees them--until this year, when a boy emerges from the dark and speaks to her. I don't really have much to say about this book to be honest. I'd been holding off reading this book forever because I wasn't sure how I would feel about it. To be honest, the main reason why I wouldn't pick up this book is because a girl I went to high school with whom I hated a lot loved this book, so I wanted nothing to do with it by association. I'd also read her other series "Shiver" and was not remotely a fan. 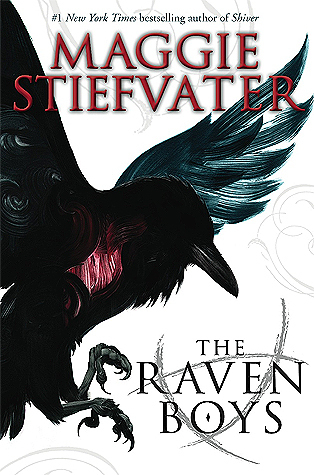 However, my friend Temecka from Library of Tomes absolutely LOVES "The Raven Boys" with all of her heart. I decided it was time to give it a go. In all honesty, I didn't hate it, but I didn't love it. In reality I didn't really even like the book. I was just bored the entire time I read it. I didn't feel anything for any of the characters and the plot didn't even remotely captivate me. Overall, I was not impressed and will not be continuing the series.